Holds up well in the sun. Plenty sturdy to support my 200# husband. I gave it an exterior matte clear coat to protect it further from humidity & rain. These chairs are on our deck on the Oregon coast. Had these now for 8mos. Place these natural finish bar-height armchairs by International Caravan Home Furnishings at your poolside cabana and serve cocktails to your guests in style. The traditional Highland slat back design adds texture and interest to your decor, and the gorgeous acacia finish seamlessly blends into your lush garden foliage. Surround these chairs with ornamental tile and potted roses to create a patio oasis. 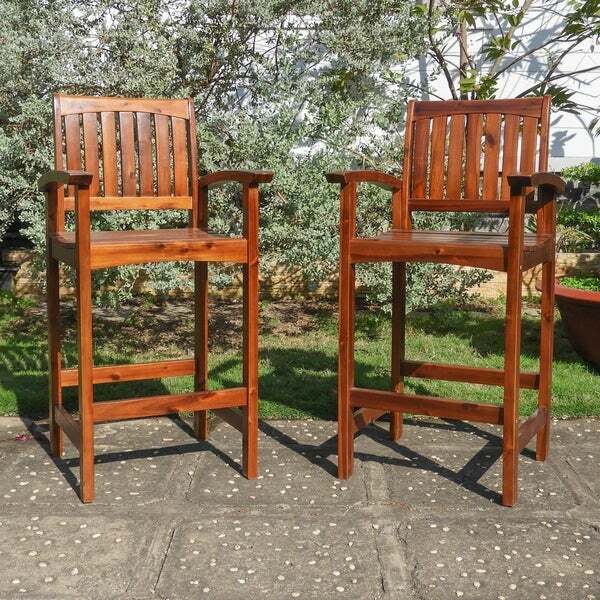 Comfortable and durable, these chairs are made of weather-resistant acacia wood and are impervious to UV rays. Set these chairs on your patio and enjoy them all year long. 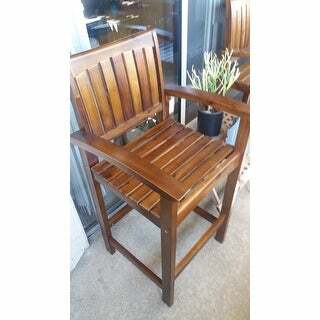 The slight contouring in the arms and backrests is comfortable and supportive, allowing you to eat breakfast on your deck without straining your back. Dimensions 23.0 In. X 23.0 In. X 44.0 In. Absolutely love these chairs. We have an outside bar and these go perfect with them and the height of them is also perfect. They are a very pretty color as well! We might order another set for the side of our bar! Great chairs, Well made and very nice looking. I have them sitting around my outdoor bar. They are very comfortable. I am a larger person and still fit very comfortably. Highly recommended. Chairs arrived in a very timely manner. Very well built chairs after you get them put together. Assembly is simple. The finish of the chairs looks just as it does in the pictures. Requires dry fitting parts and screws to assure pre drilled holes are clean of wood shavings. Suggest wood glue on dowels and pre drilled holes for stronger product. They are very nice in design and color. Fun afternoon project. We purchased 6 for our outdoor kitchen. The chairs were easy to assemble with 2 people, I do not recommend assembling by yourself. The quality is amazing especially for the price! Comfortable and look amazing on our back outdoor kitchen/pool area; practical and worth the money! Great Chairs for the price. We live in Southern California and get direct sun on the chairs which are used near our pool. I sprayed 2 coats of UV acrylic on them for added protection. Really nice! Surprisingly nice quality materials and finish. Easy to assemble. Very pleased! They look great at our bar! Chair parts did not fit together correctly. Had to order a replacement and mix and match to get them to fit. After all was said and done the chairs are great. But I wouldn't recommend due to the hassle of making it work. The chairs look great and were easy to assemble. Love them. The seat height is 29 inches. "What is the seat height and arm height?" The weight capacity is 225 pounds.